When you hear the name Carroll Shelby, chances are, you think of one of three things; Mustangs, Cobras and great Texas Chili. Sadly, the master of these incredible creations passed away on May 10th 2012 after being admitted to hospital on April 25th with pneumonia. We will surely miss him. But his legend and of course the amazing cars he created will never die. As many Ford Mustang enthusiasts know, the Shelby Mustang was not the first high performance car created by Carroll Shelby. That crown goes to the truly amazing Shelby Cobra, a car based on the good looking but poorly performing 4 cylinder British car, the AC ACE. 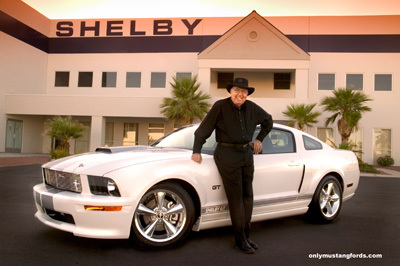 Although many of us have heard the name Shelby all our lives, not many know who was the man, before his name was attached to the Ford Mustang and how the Shelby Mustang came to be. Shelby became involved in car racing after world war 2, where he had enlisted in the Air Corps, serving as a flight instructor and test pilot. 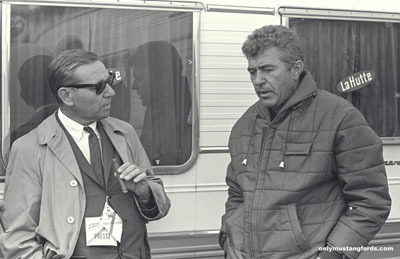 Whether his love for racing and speed was a result of his experiences there, his drive to go fast, took him many places. Shelby leaves the Air Corps in August of 1945 and starts a dump truck business. In 1949, he goes into business raising broilers, but goes bankrupt, when his second brood of chickens die of Limberneck disease. His path in cars and racing took off (literally) in January of 1952, when he drove his first drag race, in a hot-rod flat head V8 Ford powered car. In May of 1952 Carroll drives his first road race in Oklahoma, winning his first race, driving an MG TC. Not content with that, he later in the day, races much faster Jaguar XK 120's and wins again. November 1952, Shelby drives a Cad-Allard to a first place finish in and early Sports Car Club of America Race in Caddo Mills, Texas. In August of 1953, running late for a race, Shelby hurries to the track in his "farm fresh" striped Bib overalls and arrives to laughter and more publicity for his outfit than his race record. Realizing that the attention good or bad, set him apart from other racers, he adopts the outfit as his trademark! His career as a race driver spanned the 1950's, where he drove for such names as Maserati, Healey, Aston Martin and while there, won the 1959 24 hours of Le Mans. Not content to leave his legacy in only one form of racing, he also competed in the Mount Washington hill climb with a specially prepared Ferrari, winning in 1956. After a stint as a Formula One driver in 1958 and 1959, Shelby Retired from the racing scene, later to re-emerge as a performance driving school operator and the constructor of the iconic Shelby Cobra. 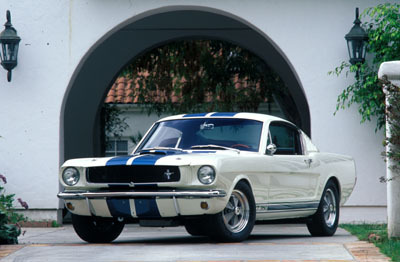 Arguably, the most important car of its time, the new 1965 Mustang garnered rave reviews from the public and the media. Its compact size, coupled with a powerful V8 engine made it a very respectable performer for the street. But the powers to be at Ford, not satisfied, with the most significant new car introduction ever... had other intentions. What wasn't said, was that Shelby's Cobra business wasn't doing well, and he needed cash. Funny how bad things sometimes turn into good things! Starting with stripped down 1965 Ford Mustang fastback "K" code (high performance 271 horsepower 289 cubic inch V8) cars, Carroll Shelby and crew turned them into formidable race track and street winning cars. After the release of the final 1969 and 1970 Shelby Mustangs, the famous Cobra moniker took a hiatus from the Mustang and Shelby American became involved in other projects. Lee Iacocca, hoped the famous name and reputation would help put some life into the newly resurrected from bankruptcy, Chrysler corporation (sound familiar?) and it's new "world car" K-car chassis. But equipped with few funds, the relationship was little more than an appearance package and marketing gimmick. While the patron saint of all things Shelby has passed on, there is still a lot to look forward to from this American legend and the Ford Motor Company. Anyone who knew him or worked for him understood his passion for excellence and his drive to make the best car built anywhere. And that fortunately isn't likely to change after his passing in Dallas. And in his continued travels all we can do is wish him well and express our deepest condolences to his family and many friends. Return from Carroll Shelby to Ford Mustang home.